Childbearing is quite a serious test for a mother’s body. She experiences both internal and external changes during 9 months. The constantly increasing weight, increasing chest and stomach affect skin and muscles. If you take no action, numerous stretch marks can appear, and your skin will remain flabby even after pregnancy. You can avoid all these troubles if you follow some rules, keep to a special diet, do simple procedures and exercise during pregnancy. Spend 10 minutes a day on your skin protection and the consequences of pregnancy and childbirth won’t affect your body’s beauty. You should start as early as possible and better no later than in the fifth month. The fight against stretch marks should be comprehensive. It must include healthy diet, applying creams and lotions, making massages and doing exercises. 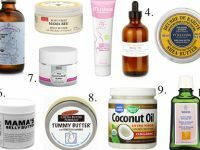 Different kinds of cosmetic and pharmaceutical scrubs, lotions, ointments and creams have most effective results in the fight against stretch marks. You should start using these remedies for problem areas (thighs, buttocks, abdomen) since the 3rd or 4th month of pregnancy. Before using any cream or lotion for stretch marks, apply a little on the inside of your arm for 20 minutes to check for possible allergic reaction. Despite the fact that all creams for pregnant women should undergo dermatological control, some components can be individually unbearable. Such cases are rare, but still you need to protect yourself and your baby. 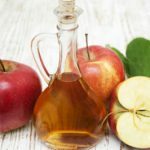 Apple cider vinegar is very effective against stretch marks. You can read about some homemade remedies with apple cider vinegar here. You can prepare DIY creams for stretch marks in pregnancy. Homemade cream is natural, without dyes and fragrances, which often cause allergic reactions. This DIY cream is very effective! It can help you prevent or get rid of stretch marks after pregnancy. Shilajit is a mountain resin, a mixture of organic and inorganic elements. It is mainly extracted in the mountains of Asia. This homogeneous mass of dark color has a specific smell and bitter taste. Shilajit has many medicinal properties. It is used for wound healing, tissue, bone and joint regeneration, in the ulcers treatment. It’s widely used to solve various cosmetic and dermatological problems. Shilajit helps to heal scars and stretch marks. It tightens the skin. This cream is the most popular tool to remove or prevent stretch marks during pregnancy. You can buy Shilajit at the pharmacy. Mix 3−4 grams of Shilajit with 1 teaspoon of water. Add 80−100 grams of baby cream. Apply your cream once or twice a week to prevent stretch marks. Apply your cream once a day to remove stretch marks after pregnancy. The result is strictly individual, but usually, the effect is seen within a week. For bigger stretch marks removal, you’ll need about a month weeks. When combating stretch marks, you can use dairy products. Mix 0.5 cups of yogurt and 1 tablespoon of vegetable oil, add 10−20g of baby cream and 1g of Shilajit. Gently apply the cream without rubbing for 3 minutes with very light massage movements. Leave the cream for 15 minutes, and then wash out with warm water. Attention! Shilajit is contraindicated during breastfeeding, but despite this, many women are using creams containing this component. If you are breastfeeding, you should better consult your physician. Grind Aloe leaves and squeeze the juice. You’ll need 0.5 cups of aloe juice. Mix 0.5 cups of aloe juice with 0.5 cup of olive oil. Add 5 drops of vitamin A.
Massage into problem areas one a day or even more often. Keep this cream in the refrigerator. DIY sugar-salt scrub for stretch marks. For the preparation of sugar-salt scrub, take 1 cup of salt and 1 cup of sugar. It is better to take sea salt with seaweed extracts, chamomile or calendula, still you can use common salt. Add 50 grams of olive oil and mix well. To get rid of stretch marks after pregnancy apply the scrub on your thighs, buttocks and abdomen during the evening shower quite often. After using this scrub, be sure to apply a moisturizer or baby oil. First results will be visible after about 3 weeks. In a month or two, you’ll completely get rid of stretch marks. This scrub is very effective, but can overdry your skin. It is used twice a month for stretch marks prevention. DIY fruit peeling for stretch marks. To make a fruit peeling for stretch marks you’ll need a can of yogurt, 1 lemon or 2 limes, almond or olive oil. Zest of one lemon mix with yogurt. To get rid of stretch marks apply 3 times a week on the affected areas. Massage the areas for about 20 minutes, rinse with warm water, and then moisturize with a lotion. This gentle your skin way of getting rid of stretch marks makes them less visible in just 3 weeks. Do not forget to moisturize the skin after peeling as lemon severely dries skin. White clay is the perfect cosmetic remedy for skin care. Peeling with white clay is effective in the fight against stretch marks after childbirth. Take 1 avocado, 3 tablespoons of white clay, 1 tablespoon of oat flakes and 3 tablespoons of olive oil. Whisk the avocado with oil, then add other ingredients and mix to a homogeneous mass. Apply the cream 10−15 minutes. Do it 2−3 times a week to get rid of stretch marks. You will see the effect of this procedure in, а month. Store the cream in the refrigerator. If you want to prevent stretch marks — apply the peeling just once a week. Jojoba oil makes the skin elastic, helps to remove stretch marks during pregnancy and after childbirth. Rosewood essential oil dissolves scars and tightens the skin. Almond oil is useful for skin, which has lost its elasticity. Oil from grape seeds has regenerative effect; it also significantly improves the skin elasticity. Peach oil will be useful for loose skin because it has anti-aging and emollient properties. You can use several components at once. Before applying the oil, check the skin for allergic reactions. More about how to use oils for stretch marks. What to eat to prevent pregnancy stretch marks? Your pregnancy skin condition depends on what you eat. To prevent stretch marks during pregnancy, eliminate pastry, flour confectionery and sweet products from the diet. Discipline yourself to salads without mayonnaise. Use vegetable or olive oil instead. Eat more nuts, cottage cheese, hard cheese, beef, chicken, olives, plenty of vegetables and fruit (except citrus). It is much easier to prevent stretch marks during pregnancy than to fight with skin problems after childbirth. Massage is one of the most effective procedures, which will help to keep your skin in perfect condition. It is best to combine massage with the application of body cream or olive oil. Daily water massage during taking a shower improves blood circulation and makes the skin more elastic. Discipline yourself to making self-massage while taking a morning or evening shower. With circular motions, spray water onto the affected skin areas or on problem zones. This regular simple procedure will improve the condition of your skin, and will prevent stretch marks appearance. Exercises will make your skin elastic. A special set of exercises (stretching) will help prevent stretch marks. Buy a gymnastic rubber ball — fitball. It is indispensable in the fight against stretch marks. Do this simple set of exercises 4 times a week. Sit onto the ball, swing the pelvis from side to side. Your movement should be smooth, without jerks. After that, move on the ball clockwise and counterclockwise. (2 minutes in each direction). Exercise 3. No marks on my belly. Lie on the floor. Bend your legs at the knees and put them on the ball. Gently lift your body to reach your knees. Do this exercise in the 3rd -5th months of pregnancy when your belly is just starting to grow. If your abdominal muscles are in good shape, stretch marks won’t appear. Prenatal bandage is a good way to prevent stretch marks. It helps «to hold» your stomach, relieves your back, and prevents abdominal muscles from stretching. Doctors recommend wearing prenatal bandage since 6−7 months pregnant. If you have a large baby or a big belly, or if this is not your first pregnancy, you can start wearing a bandage even earlier. Bandage mustn’t compress the abdomen, its main function is to support. If you feel some discomfort, then choose a different model or size.